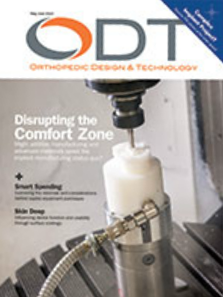 Glebar Featured in This Month's ODT Issue: "Capital Investments"
Making a poor selection on a component for a project or a material for an implant can create delays or increase costs. Getting a capital equipment investment wrong, however, can have a more significant negative impact on an entire company, especially when it’s a smaller firm. Therefore, ensuring that all factors are considered prior to making a machine purchase is paramount. With this in mind, Orthopedic Design & Technology reached out to a number of industry leaders to ask them about the process. They shared their insights on an array of questions on the topics of investment strategy, leasing, training, new capabilities, and more to aid device makers who may be looking to explore the options available to them.